I am in a bit of denial that summer is pretty much over. If it’s still hot and muggy, and the cicadas are still singing, and I’m still wearing sandals to work, then it’s definitely still summer…right?! 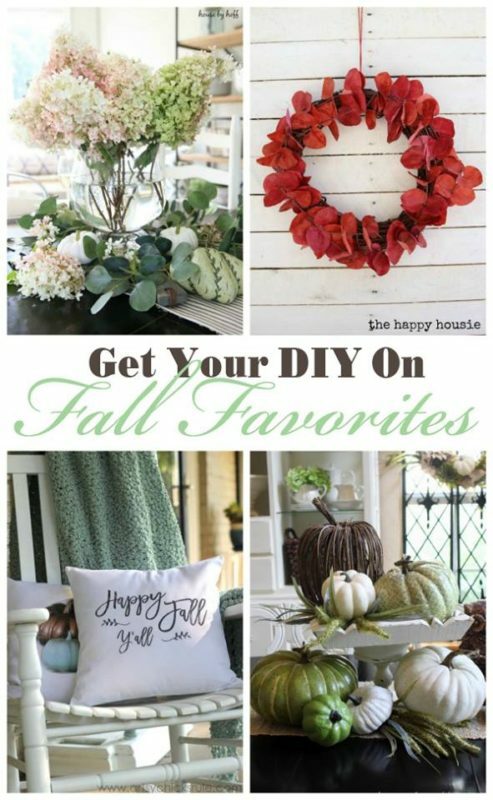 Even though we’re in the last lovely days of summer, I’ve been getting my home ready for Fall Home Tour season. If you’re not a blogger, then you might not know about it, but it’s a real thing. We have to have our homes season-ready and photographed before the actual season begins. We’re like Hobby Lobby, we start getting the decorations out for Christmas in August. Instead I snipped some hydrangeas from my dear friend’s gorgeous hydrangea bush and put down a base layer of eucalyptus leaf sprigs. *Side note: I’ve learned how to spell eucalyptus without looking it up. It’s a little thrilling every time I type it out and no little red squiggly line appears underneath. I feel so smart. 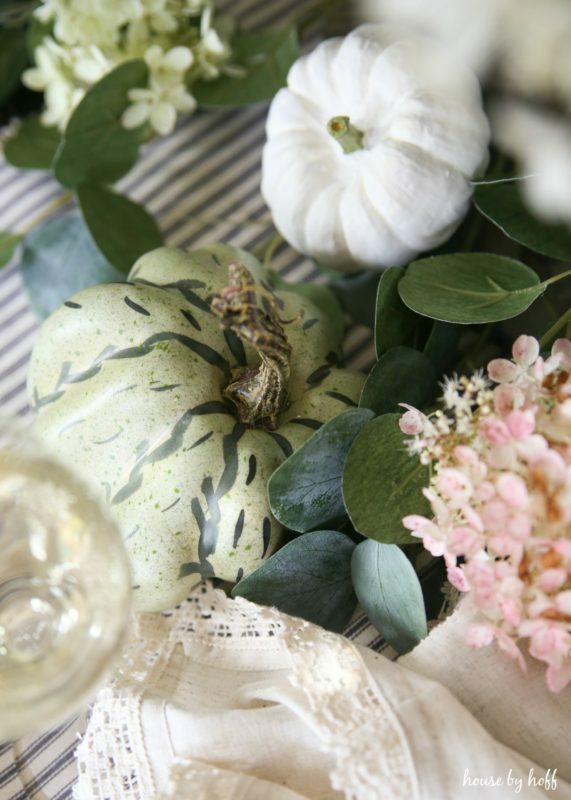 Next, I layered in the little white pumpkins and green gourds. 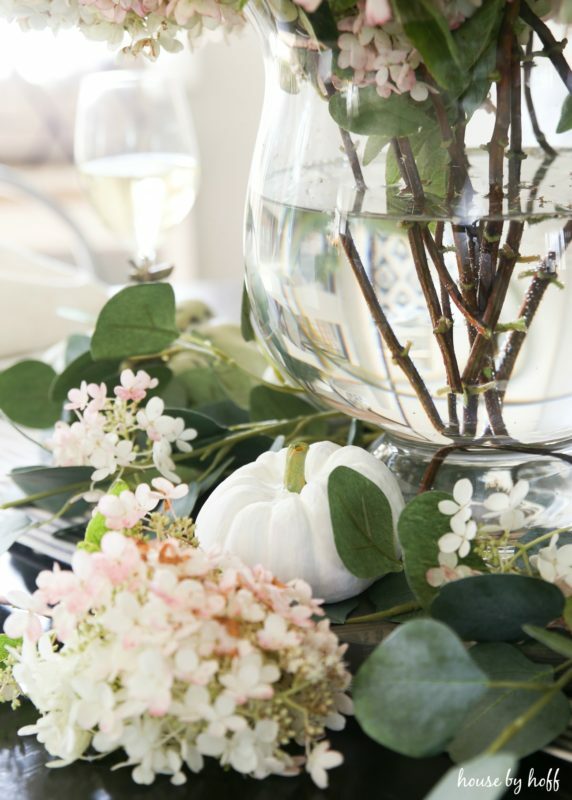 Last, I added sprigs of hydrangea to finish this early fall tablescape off. 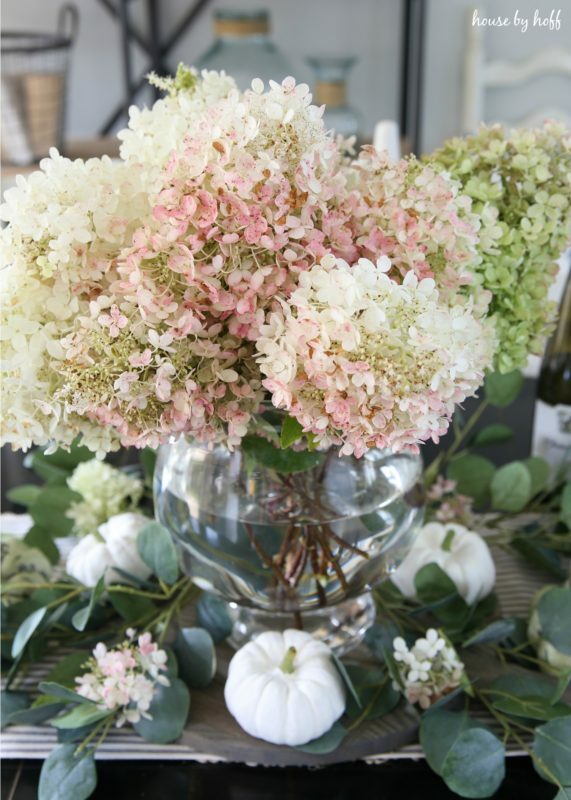 Since hydrangeas dry so pretty, I figure I can leave this tablescape the way it is for awhile. I had the most amazing time photographing this vignette. My favorite thing to do on a lazy weekend morning is play a little music, make something pretty, and take pictures as long as Miss L. lets me. 😉 It’s very theraputic. 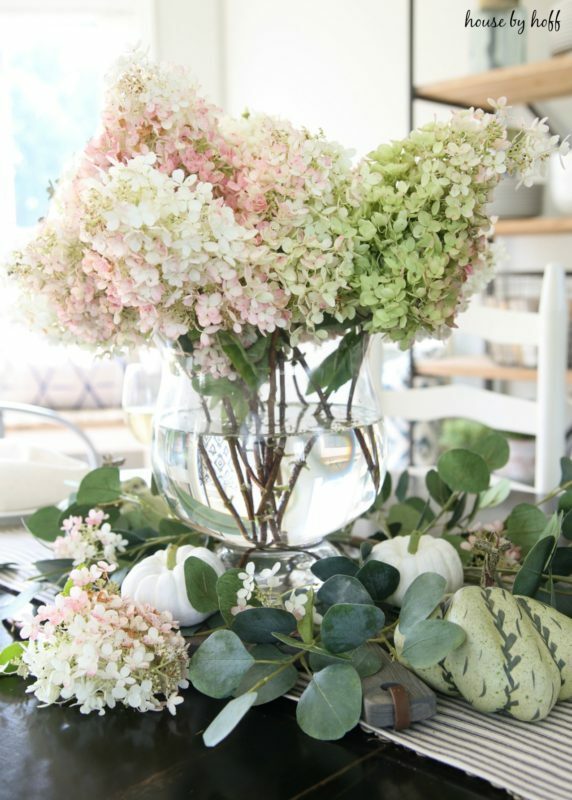 I just love the way these hydrangeas are tipped in pink…Does anyone know the exact variety they are? I want to plant some in the backyard, but my friend isn’t exactly sure, and I have no idea. Yes, summer is lingering for just a little longer, and I’m happy about that. Fall will be here soon enough. Don’t forget to link up our favorites Sunday at 7:00 PM! the table scape is beautiful! Wow! I have never heard the “iron nails” trick! That’s awesome! Thanks so much, Vila! I love it! You nailed it girl. Tans. Hey girl love the post! I am so ready for Fall! 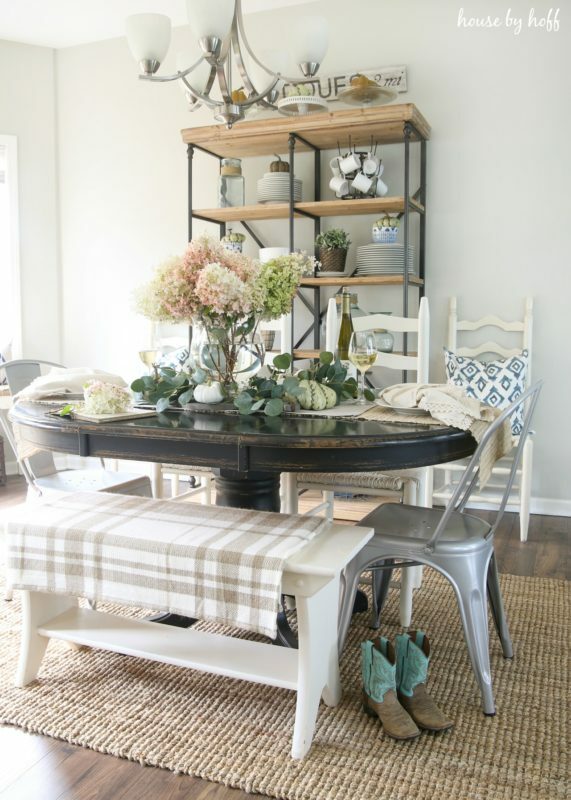 Love the tablescape! April, this looks so soft and beautiful. 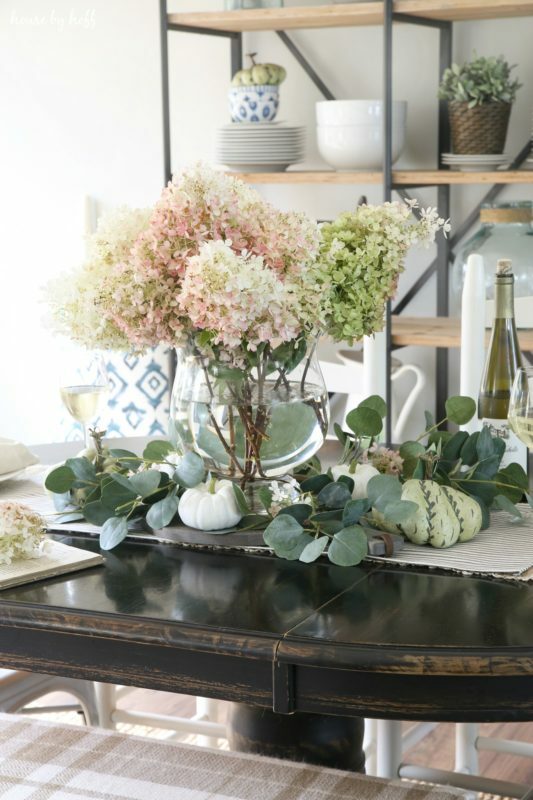 I love the way you laid the eucalyptus as a base instead of adding it to the hydrangeas. I believe the ones you have are limelight. I have a little limelight ( they won’t grow as tall as the others do, maybe 3-4 feet) and they are turning and look the same as yours here. They are pretty hardy and they bloom so nice. I also loved your hashies about Hobby Lobby, so funny but true! Thank you so much for sharing these adorable photos. I like this type of decoration for fall. The combination of flower, green plan in the house always bring wonderful effect. So beautiful! 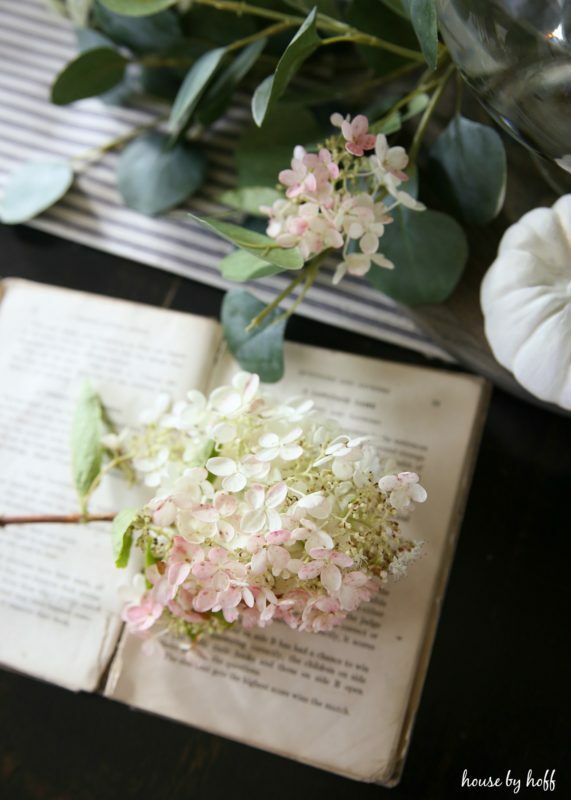 And I think those may be limelight hydrangeas, I like summer because I go to the beach, yeah yeah! 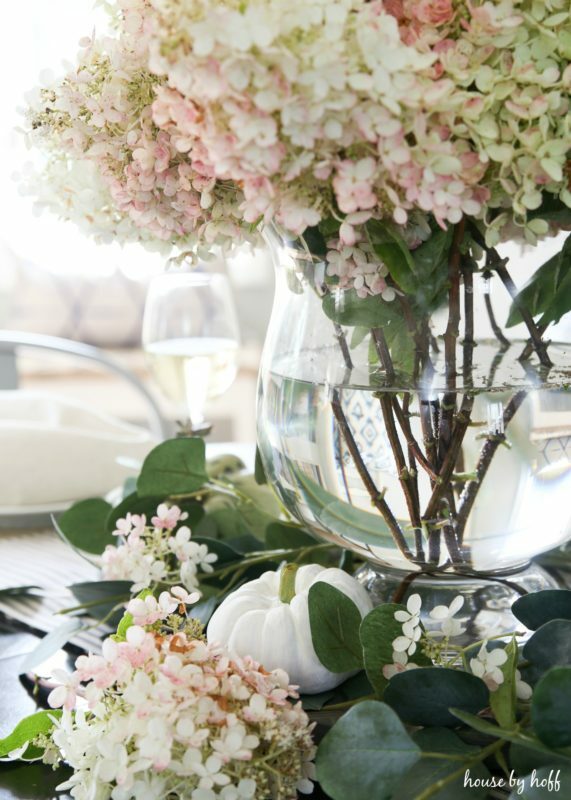 OMG, I’m in love with those hydrangeas. My most fav flower ever. They really brighten the room. What a gorgeous decor. A thousand of thumbs up for your nice pics!